Join us for a day of marksmanship fun and competition. 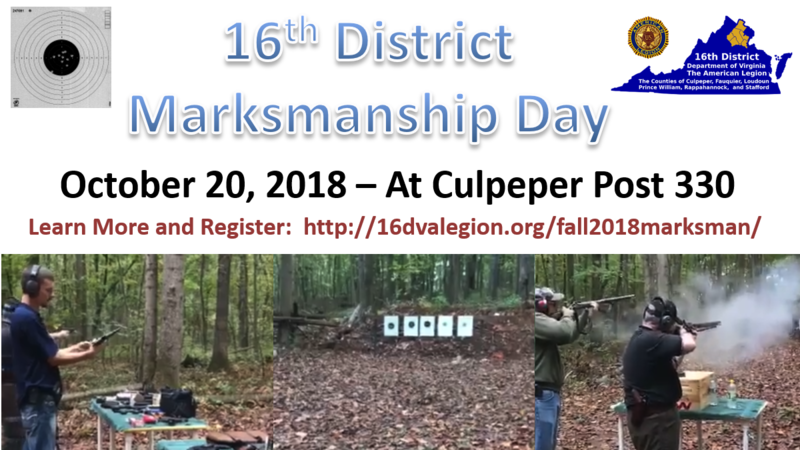 The 16th District will be holding a Marksmanship Day on October 20, 2018 starting at 10:00 AM. Activities will include open shooting time (enjoy shooting weapons that others may share), and then a competition period where you can compete in one of the categories below (standing shot only). You do not need to own a firearm to participate. The event will be followed by free lunch hosted by Post 330. Limited Pistol – 22 caliber semi-automatic or revolver using factory iron sights (peep, ghost, optical or electronic sights ARE NOT allowed). Six shot score at 25 feet. Limited Rifle – 22 caliber rifle using lever, bolt-action or semi-automatic using factory iron sights (peep, ghost, optical or electronic sights ARE NOT allowed). Six shot score at 50 feet. Metallic Pistol – Any caliber semi-automatic or revolver using factory iron sights (peep, ghost, optical or electronic sights ARE NOT allowed). Six shot score at 25 feet. Metallic Rifle – Any caliber rifle using lever, bolt-action or semi-automatic using factory iron sights (peep, ghost, optical or electronic sights ARE NOT allowed). Six shot score at 50 feet. Open Pistol – Any caliber semi-automatic or revolver using any sights (peep, ghost, optical or electronic sights ARE allowed). Six shot score at 25 feet. Open Rifle – Any caliber rifle using lever, bolt-action or semi-automatic using factory iron sights (peep, ghost, optical or electronic sights ARE allowed). Six shot score at 50 feet. Musket Rifle – Any caliber rifle using musket loading technology only with iron sights only. Awards will be presented at the 16th District Fall Conference Legion Breakout Session which starts at 2:30 PM. Hearing protection and eye protection are required and must be provided by each participant.